But if you want things to be different you have to change! Spark Global Business Caribbean welcomes Diana Douglas to the Team. Operational, Event and Marketing Management experience among many other skills. The drop in visitor numbers and reduced spend . 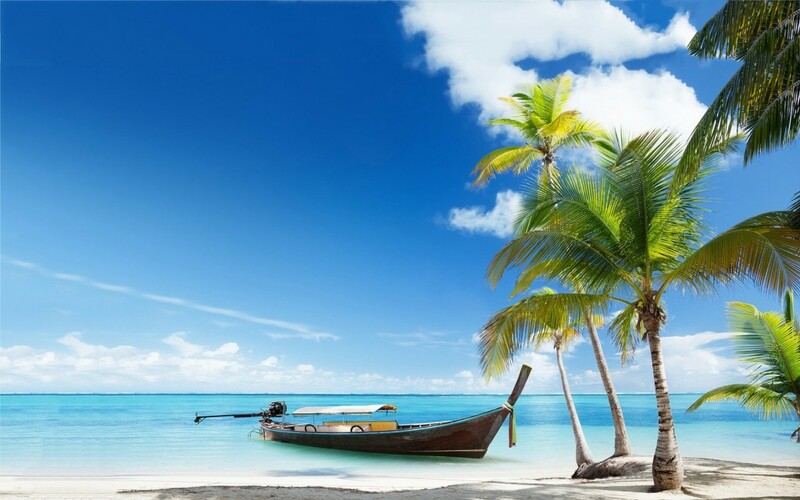 . .
Barbados was chosen as our first site due to the very strong entrepreneurial nature of its population. Partly born out of necessity through lack of jobs due to the extended world recession, many graduates from CHSB and other colleges decide to go their own way and live the dream. Business activities in this beautiful region have tended to rely on tourism as its main business sector. The drop in visitor numbers since 2008 has made the population think about alternatives, in many cases starting a business from hobbies, merely to ensure the household bills are paid every month. Over the past 20 years or so Spark team members have worked with individuals and companies on making them be the best they can be. Businesses revolve around people and money. If the people perform well then money follows that success. Some ‘modern’ training seems to have forgotten that business needs to be kept simple to enable as many people as possible to ‘get’ what the business owners are trying to achieve. It really is simple – you buy or make something for $x and sell it for $y and the difference is either profit or loss. Of course, if you make too many losses you don’t stay in business for long. Our programme entitled ‘The Integrated Entrepreneurial Pipeline – Part 1’ has been specially created for the new entrepreneurs of Barbados. Part 1 of our ‘Integrated Entrepreneurial Pipeline’ helps new entrepreneurs learn all they need to know about setting up and running their businesses. In particular it focusses on all aspects of creating a business plan designed to secure funding for your project. Part 2 concentrates on Growth in an accelerated form to up and running business owners. Participants in the 12 session programme learn the A-Z of starting and running a business. More than that is the continuous mentoring, assessments, training, funding, etc. that is available after the initial 12 sessions. They culminate in the new entrepreneur having a business plan that is fit to attract funding. We at Spark understand how the Bajan culture is different from that in the UK. So in addition to our UK team we have recruited top performers on the island to work with us on the material and present some of the seminars, workshops and game-based learning that make up the programme. Spark UK where it all started has grown into an organisation that has worked in Europe, Africa, USA and Central America. Most recently agreements have been reached in Nigeria, Qatar and Bahrain to provide commercial awareness training for public employees as well as those ‘intrapreneurs’ in private sector organisations. With that very much in mind, we have created Part 2 of our programme which is aimed at owners / executives and managers of more established businesses that are looking for fast-track growth. The format is the same as Part 1 with 12 sessions spread over a 21/2 month timespan. Again we have local input in the content and presentation of the programme. This course culminates in a sustainable Plan For Growth which can be implemented by participants using the knowledge they have learned on the course and eliminating the type of errors that we’ve all made in the past. Our experience in running and working with businesses across many industry sectors is what sets us apart from other organisations. Our team has been there – and done it, losing a few, but winning most!! We are helping to reduce the welfare burden on the Barbados Government. The entrepreneurial spirit of Barbados makes this an area that can buck the system and create wealth.We are at the forefront of such developments and have become the ‘go to’ organisation for new and existing entrepreneurs and business owners who want success and are prepared to do whatever it takes to achieve that. We are proud of the work we have carried out in the field of effective leadership development. That in turn enables ‘intrapreneurial’ employees become commercially conscious thus enabling directors to direct their businesses. Business owners learn to understand money in business and how to create their own business plan with a view to sourcing funding. In November 2015 we created a model for the introduction of Spark Global Business Caribbean (SGBC) to Barbados. Our aim is to help make Barbados a major hub for entrepreneurs, in accordance with the stated aim of the Barbados government of making the country the number one choice of entrepreneurs by 2020. 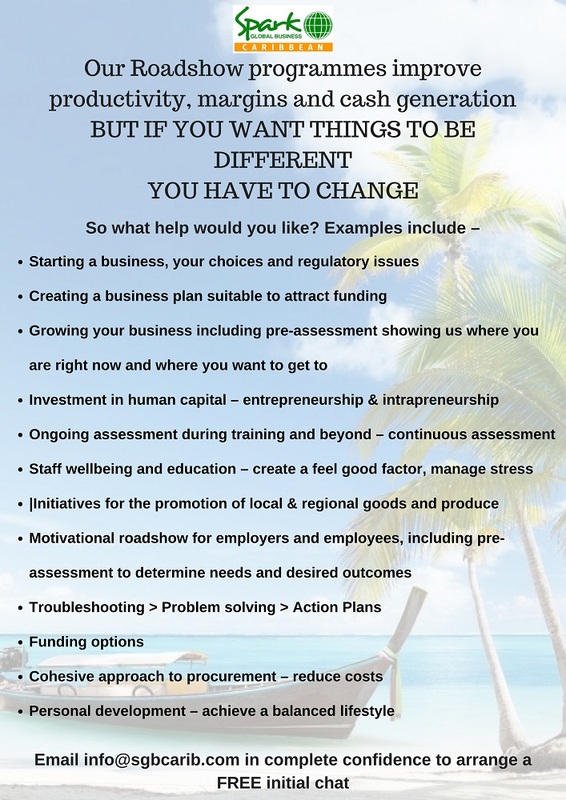 In challenging times, SGBC are making good progress in introducing their brand on the island by getting a foot in the door with several public and private sector organisations. We hosted successful seminars in late March 2017 on Entrepreneurship and Intrapreneurship attended by Barbados government ministers and business leaders. They were well received and supported and provided a springboard to enable SGBC to move forward. Several attendees of the seminars have become our clients / partners. We have taken equity stakes in 3 growing businesses – online sales, fashion and media sectors. We are also working with entrepreneurs in agriculture, tourism, education and sport. Progress has also been made in our consultancy offering within private and public sectors. The quality of introductions that we have received has speeded up the process and we working with 4 major private sector businesses, 3 government agencies and several SMEs. In addition we are speaking with several other similar organisations. Neil Fogarty presented at the seminars mentioned above and introduced his own special brand of Intrapreneurship which went down extremely well with the audiences. The work that he carries out with mainly public sector organisations in the UK can be replicated in Barbados. We are on several tender lists and have been shortlisted for relevant government consultancy contracts. The team has been strengthened by the addition of Kirk Brown as an Associate. Kirk is a Barbadian Singer, Radio Presenter, Host, DJ, Actor, Motivational Speaker & Entrepreneur. With a social media audience of over 150,000 collectively, his following continues to grow with his continuous bookings and appearances at major regional and international events. He has already made several successful introductions for SGBC. More collaborations are the key to our growth, engaging further high-quality multi-disciplined associates. With our growing reputation we are expecting an increased demand and we anticipate taking further equity stakes as investments. At this time we have four prospective clients / partners in the wings. Three operate in the agricultural sector - chickens, pig farming and organic fruit & vegetables. All are seen as major growth areas in the Caribbean. The other is IT based and involves worldwide distribution of a successful programme operating in Barbados. The diversity of our team has enabled us to increase our offerings across various industry sectors with large and small clients. We see that as crucial to our growth plans in Barbados and other Caribbean islands.